A bad witch's blog: Scrying With My Drum - What Can You See? Scrying With My Drum - What Can You See? 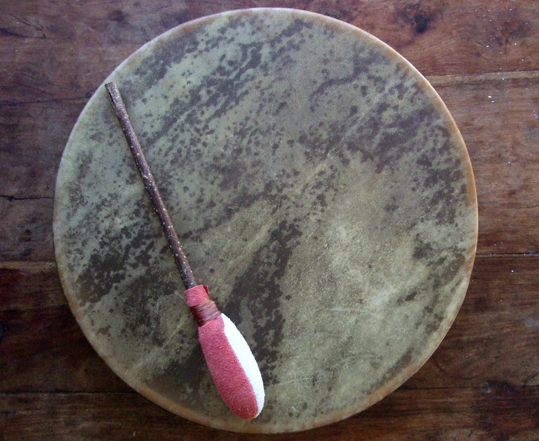 As well as playing the drum I made recently at a shamanic workshop, I've been scrying into it. Scrying, as most people who read my blog will probably know, is divination by looking into things. The word actually just means "seeing". It is most often practised in order to get messages, guidance or inspiration by interpreting shapes seen within things. While crystal balls, dark mirrors or cauldrons of water are probably the best known things to scry into, you can scry into pretty much anything. Jon of Heron Drums, who taught the shamanic workshop, recommended scrying into the drum skin both before it dried and afterwards. That was because the appearance can change as it dries out. I do see new things in it every time I look. He also said that it was fine for the owner or creator of a drum to tell other people what they see in the skin, but others shouldn't suggest things that they see to the owner. Now, I'm not too sure about that. For a couple of weeks I've been trying to write this blog post and describe all the things I've scried, but it seemed a bit like bragging: "Ooh look what a wonderful drum I made! It must be special because I can see all these things in it!" I genuinely think that anyone's insights are valid. So, I'm going to go against advice and ask: what can you see? In the bottom right I can see a horned helmet ,or maybe it's just a pair of horns , near the top a outline of a deer . I have to turn the drum a little way anti-clockwise, then I see a forest of trees, and a howling wolf sitting behind the head of the drum stick . In my drum I see a badgers head. Its very interesting to know what other people will see. So who has the authority to tell a person what to do and what not to do ? It is really interesting that different people see different things. I must admit that I also saw a deer at the top. Regarding the comment about who has the authority to tell a person what to do, well it wasn't quite like that. Jon was the teacher at a class I was attending. I was his student. His remarks were those of a teacher to a student. He has made thousands and thousands of drums. I had made none before this. A good teacher suggests things, what were the reasons given for others not to comment what they see ? A problem with exaggeration rather than actual sums, but yes, it was a turn of phrase rather than a calculation. I also probably didn't get across his tone of voice. Jon was a good teacher and didn't seem bossy in any way. He felt that our connection with our drums was a personal one. Sorry, for any confusion caused. It is sometimes difficult to express things precisely enough in short blog posts. Thanks for your thought-provoking comments. I'm so glad that people are finding this post and discussion interesting.